Can I Recycle My Bicycle Helmet? Summary: The only recycling program specifically for bicycle helmets that we know of is in Portland, Oregon. Some parts can be reused if you take the helmet apart. You may be able to put the outer shell in your regular plastic recycling bin, and you can crumble the EPS foam and use it for packing material or as a soil softener. We have a link to an EPS recycling program for the foam. There are no organized national programs for reusing or recycling helmets. There is one local program begun in 2011 in Portland, Oregon, that holds promise of becoming a national model. Some of the reasons that no helmet promotion programs want used ones are outlined in our page on buying a helmet at a yard sale. In brief, you can't be sure it has not been damaged. The best reuse of old helmets comes from Bainbridge Island, WA where the annual Rotary Auction receives helmets among other things to resell. They have decided to offer the helmets back to the community through the neighborhood emergency prep groups as part of a kit to be kept under the bed in case "the big one" hits. The helmets will serve as the hard hats suggested as part of the earthquake readiness kit to protect against falling debris. There are limited other possibilities for reusing a helmet. You might plant flowers in it and hang it on your front porch. The vents are good for draining the pot if you overwater. The nylon strap should last for a long time. 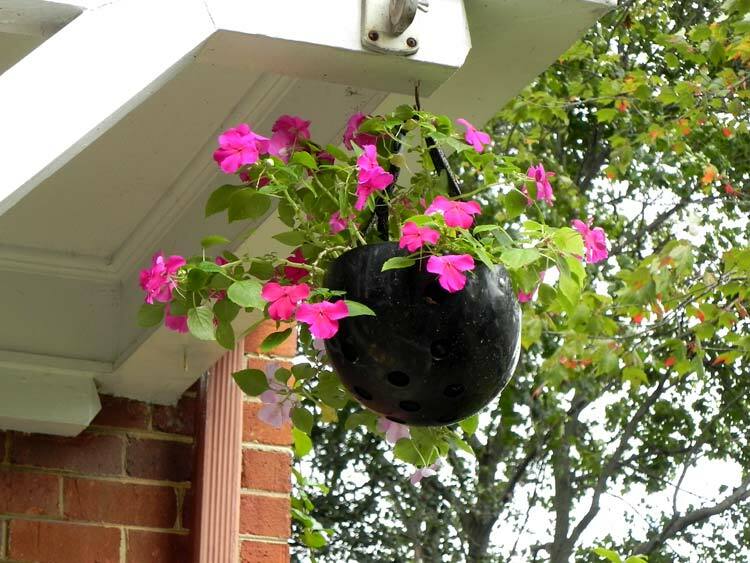 The helmet/planter will advertise to the world that you are a bicycle rider. Hunters might hang their old helmet in a tree and use it for target practice. Be careful of your backdrop, of course. And your local Emergency Medical Service may be able to use your old helmet as a training aid, teaching new EMS technicians how to treat a helmeted rider who is injured and on the ground. The EPS foam in your helmet is similar to the packing "peanuts" you get in boxes with all that stuff you buy over the Internet. So you can crumble that foam and use it to pack the cookies you send as holiday presents. Or you can crumble it into very small pieces and use it as a soil amendment, to lighten clay or other compacted soil. It can't be reused by helmet manufacturers. It would be structurally inferior if reused, and a helmet would have to be made much thicker and have more internal reinforcing or fewer vents to meet impact standards. There are enough quality control problems already with virgin EPS to discourage anybody from recycling it in a helmet. The Portland program is trashing helmets with internal reinforcing in the foam, representing a large percentage of the more expensive models. Disposing of a helmet in an environmentally responsible way is not easy either. Most helmets have a plastic shell, EPS foam liner, nylon or polyethelene straps and a plastic buckle. Most local recycling programs don't want mixed materials. So your best solution may be to take the helmet apart, put the plastic shell in your plastic recycling, break up the EPS foam for use as packing material or a soil amendment, and pitch the strap and buckle in the trash. That is the approach that the Portland program is using. But unless the manufacturer tells you in the helmet manual or on a label, you don't know if the plastic in the shell is recyclable. Some shells are made of PET, the same plastic used for bottled water. Those are recyclable, but others may not be. Only the manufacturer knows for sure. High-end helmets are often made from polycarbonate (GE's Lexan for example) and that can not be included in local recycling pickups. If your helmet has a fiberglass or ABS hard shell, that has to be pitched, since it is not recyclable in most local programs. Local programs vary in the plastics they can take, so you may need to check. The Italian manufacturer MET is the only one we have heard talk about the lifecycle of their products and recycling. Their 2010 catalog says: "We take into account the complete life cycle of the products we develop. Thanks to the development of new waste treatment technologies it is now possible to dispose of our helmets at the end of their lifespan without harming the environment. Only a few sites are currently available around the world, however, we are confident that they will become more easily accessible in the future. Meanwhile we are selecting components and materials to ensure our products are fully compatible with such waste treatment processes." We regard that as a weak statement, but it is in fact ahead of other manufacturers who don't even seem to be aware of the issue. The solution below is probably one of those "few sites are currently available. The Alliance of Foam Packaging Recyclers has a page on recycling EPS foam. You can remove the EPS from your helmet and mail it or take it to one of the sites they list. Just don't take it in a car and use the earth's non-renewable fossil fuel resources to get it there! If your community has a "co-generation facility" that burns trash to make electricity, you can pitch the helmet in the trash knowing that at least it will not end up in a landfill, where the EPS would last for a lifetime. EPS burns cleanly, producing only carbon (C), carbon dioxide (CO2), carbon monoxide (CO) and water (H2O). So it releases carbon into the atmosphere, but at least it does not produce sulphur or heavy metals. The energy contributed to making electricity is considerable, since 1 kg of EPS=1.3 litres of oil. (We are indebted to Finnish EPS maker Epsira Oy for this info.) Given that oil content, the carbon footprint is already established and release into the atmosphere sooner or later will be difficult to avoid. If EPS can be recycled, can it be used in new helmets? In 2013 the major foam manufacturer Polysource developed a product they call Round2, a direct replacement for their standard helmet EPS. Early indications are that it performs nearly as well as virgin EPS, so there is hope. In 2015 two manufacturers announced models using recycled foam: Urge and Kali. The next year, Giro brought out their Silo model with a liner made of corn-based Expanded Polylactic Acid (E-PLA). Liner density and appearance are the same as the standard EPS, but the liner is bio-degradable. The hard ABS shell is separate, since recycling requires separating the helmet liner from the straps, shell and buckles. ABS is potentially recyclable, but is not in practice. It should be possible to replace the E-PLA liner in the Giro and reuse the ABS shell. One obvious answer to improving helmet recyclability is to redesign the helmet with a view to recycling the materials at the end of its life. But there are good reasons for the foam used in the liner, for the internal reinforcements that the Portland program trashes and for the plastic shell on the outside, and no helmet user would want to sacrifice impact performance to make sure the helmet can be recycled later. There is progress to be made in that area, but it will be slow. In 2014 several manufacturers introduced helmets with non-foam impact protection liners. Smith Optics and POC both have liners combining EPS with other materials. There should be more to come, following years of use of collapsible plastic constructs in some lacrosse and football helmets. At least one designer is experimenting with helmets made of sustainable flax and linen-reinforced helmets are already on the market by Urge, a pioneer in the green helmet field. Another is well along with designs using a corrugated paper liner similar to cardboard. It has to be coated to resist water, so would not be recyclable. And Kali Protectives has a helmet using a shell made of a corn-based polymer. In 2016 designer Isis Shiffer is working on the Eco Helmet a new helmet made of recyclable paper in a radial honeycomb pattern. It will fold flat and be very inexpensive to produce. They are intended to be readily available for shared bike system users. A media reports says it is not yet certified to CPSC as of August 2016, and the testing shown on the company's video does not even approximate the CPSC lab test protocol. Spitfire Industry is developing a new helmet known as the Eco made of recyclable paper in a radial honeycomb pattern. It will fold flat and be very inexpensive to produce. They are intended to be readily available for shared bike system users. A media reports says it is not yet certified to CPSC as of August 2016, and the testing shown on the company's video does not even approximate the CPSC lab test protocol. EcoHelmet plans to launch early in 2017. Just one cycle clothing manufacturer that we know of has established a recycling program for their products. Loeka set up their program in 2011. It covers only women's clothing products, not helmets. We hope helmet manufacturers will follow suit. If you find other ideas on recycling helmets, please let us know. Now that there are millions of old helmets being pitched or reused every year, the recycling question is well worth asking.